Large (1-1/2 - 1-3/4") - 1pc. Fluorite "Puff" Heart - These Fluorite "Fluorescent Puff" Hearts are made from "extra" quality Fluorite and each of these pieces have an amazing Blue & Purple Fluorescence when viewed under an ultraviolet light. Most of these fluorite puff hearts also have some surface fracture lines typical with Fluorite crystal. 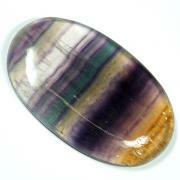 This grade of Fluorite has deep colors, many include rainbow striping. Please Note: In order to see these beautiful stones fluoresce, you will need a UV light (not a "Black Light"). In addition to the general metaphysical uses of Fluorite, there are additional traits associated with different types of Fluorite. Fluorite occurs naturally in many colors, and slightly different additional properties are associated with each color. Rainbow Fluorite exhibits a combination of properties. 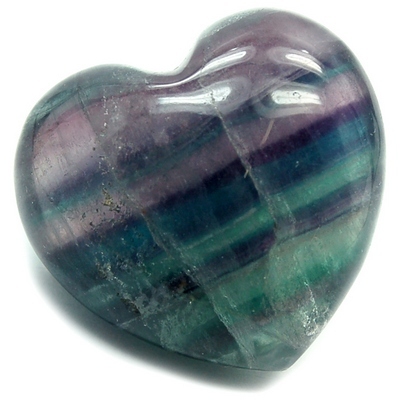 The colors of these fluorite hearts vary — let us choose for you. Blue Fluorite, when used with the Third Eye Chakra, brings spiritual awaking and clear communication between the physical and spiritual planes. 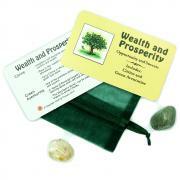 Used with the Throat Chakra, Blue Fluorite aids in orderly communication of intuitive insights. 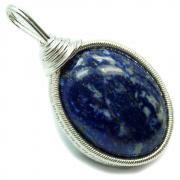 The calm, serene energy of Blue Fluorite brings inner peace.